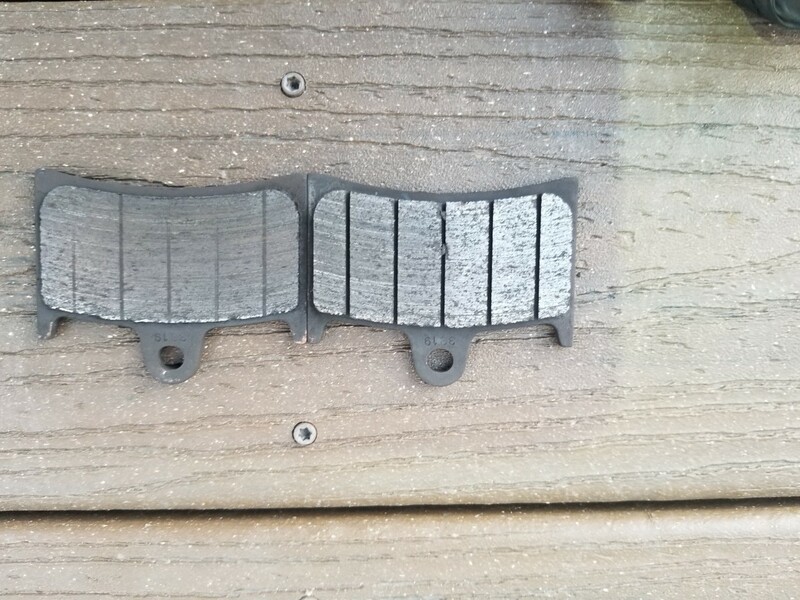 This afternoon, while servicing my bike, I pulled the brake calipers to check the pads and discovered that the front right pads were wearing unevenly (see attached pic). When I pulled the other two calipers, pad wear seemed even. 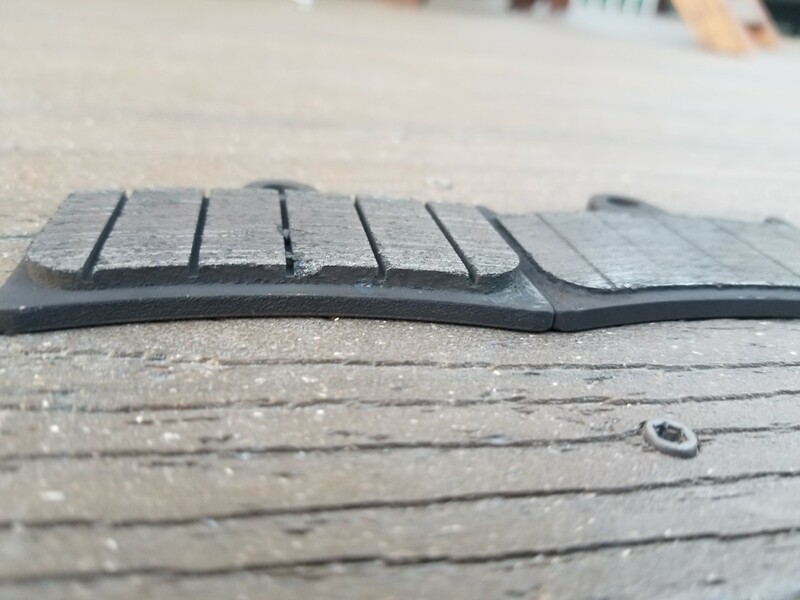 Interestingly, while I didn't find uneven wear on the left caliper, I did notice that both pads have a very similar crack in them. Any idea of what the cause could be? No idea on the cracking, but on the caliper where one pad has worn excessively, i’d first check whether the pistons on that side are sticking, possibly from a build up of crud - maybe make sure they run in and out smoothly. Use a spray brake cleaner and a toothbrush to clean each piston. Gently work them in and out about a quarter of an inch (don't pop one out) and continue cleaning until they move easily. Thanks. Too late not to pop one out. I accidentally popped one out by pumping the brakes with the pads off (don't ask me why I did that) so now I'm taking them apart and cleaning them. I would tend to say yes if they are not damaged. How many miles on the bike? The issue I have is that getting these seals might take a while. Don't know who stocks them in my area. Its your own call on whether the seals can be reused. That said - I strip mine every year - totally clean and reassemble using existing seals. 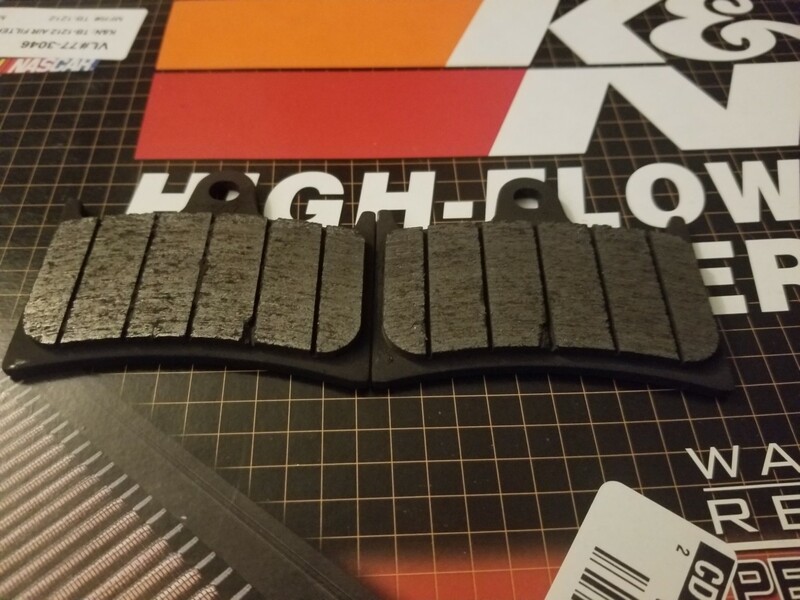 I keep a spare set of pads on the shelf to change whenever I'm getting a bit low - bike has nearly 30k on it and brakes are perfect. So, brakes are completely disassembled now. Took the calipers to a shop to get out the seized pistons and fortunately they were able to do it. I didn't have the tools here to get it done and didn't want to mark the pistons with pliers. Now, the most interesting issue is that, while I was there, I asked them to order sets of seals and a set for one caliper is going for $67!!!! Both sets of seals would cost a staggering $134 plus shipping. Is this price normal? I sold my GSA in part because of higher maintenance costs. $134 for a set of seals for the front sounds incredibly high. Where are you guys sourcing your seals from?? Sounds steep to me! World of Triumph appears to be saying that a complete piston & seal kit is 31.80GBP per caliper! I'm seeing 60 GBP for the piston and seal set at WoT. Price is per caliper. Comes out to a similar price in USD.